Huab Lodge began as an idea to generate funds to save the desert -dwelling elephant from being harassed and shot. Huab Conservation Trust and Huab Lodge was setup as low impact and eco- friendly establishment with sustainability in mind. Since 1992 awareness has increased, as has tourism and the “value” of the elephant is changing. The original farmland is a small, unique area called Monte Carlo that boasts stunning views bisected by the mostly dry Huab River. The former rest camp, which accommodated tourists in the 1970s, now houses the lodge’s staff.At a special site just down river from the old rest camp, where the Germans built the so-called German Bath in the late 1800s, Huab Lodge was erected. Despite its size the unique main building blends well into its surroundings. The irregular thatch roof mirrors a mountain on the opposite bank. The stone and thatch bungalows spread along the elevated north bank of the river ensuring a private and magnificent view - even from the shower! Huab Lodge with all it has to offer and being off the beaten track is not a place for a single night-stop. You should allow several days to enjoy and absorb the tranquillity and quiet, the welcoming and comfortable atmosphere, and the many activities. There is an airstrip near the lodge. Huab Lodge has been awarded Gold from Iwanowski, and for 16 years in a row with the Hospitality Award of Excellence as the best Lodge. Also, Huab Lodge has been honored for its low impact, eco-friendly and sustainable setup with the ECO-Award Namibia. 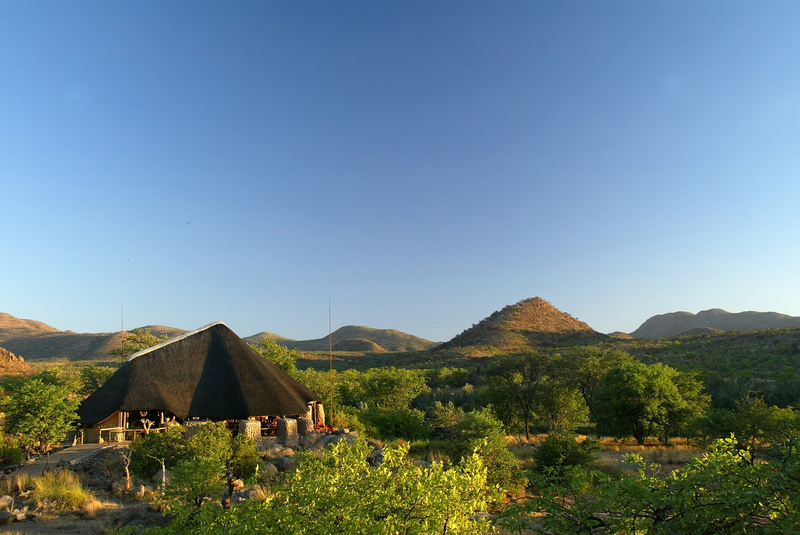 In Tripadvisor, Huab Lodge is rated as #1 Lodge in Namibia.